On paper, the last week for the North Dakota State women’s basketball team was always going to be tough. In a Summit League that is definitively split into top and bottom tiers, taking on the two South Dakota schools while sitting 1-2 in the standings is a tough week. In reality, it is even tougher. 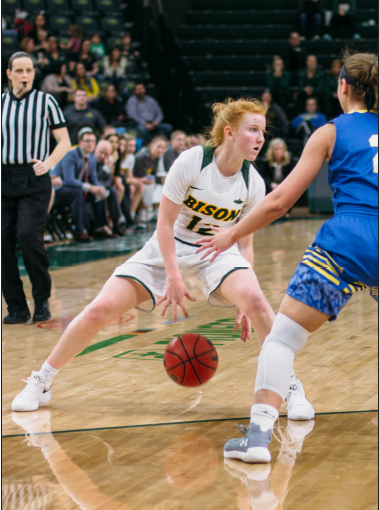 The Bison took a pair of losses, the first at home to South Dakota State, 85-64. Three days later, NDSU dropped an 80-54 contest at South Dakota. On Thursday, the Jackrabbits hopped out to a fast start. The tone was set just 10 seconds in when Alexis Alexander drained a three for the Jacks’ first bucket of the night. After just 10 minutes of play, the SDSU lead stood at 21-10. The Bison were just 5-12 shooting in the opening quarter. NDSU was plagued in the second quarter with turnovers. The Bison coughed the ball up seven times in the second 10 minutes. The Jacks were happy to oblige, growing the lead to 33-12 nearing the midpoint of the quarter. NDSU would muster up a small comeback, with sophomore Sarah Jacobson hitting a pair of threes split by a three off of Macey Kvilvang. With the momentum hanging with the Bison, SDSU quickly squashed the comeback attempt early in the second half. Alexis hit another early three as the Jacks scored the half’s first six points. SDSU didn’t take their foot off the gas in the third. After the first bucket of the fourth, the lead was at 30. The Bison chipped some of the gap back, but it was too little too late. Jacobson led the Bison with 16 points on the night. NDSU was out-rebounded 39-25, including 15-6 on the offensive glass. The test was much the same in Vermilion. This time, NDSU kept it close early, but were aided by a cold start from the hosts. After five minutes of basketball, there were just nine points between the two teams. After 10 minutes, four Bison had a field goal and the Coyotes held a slim 12-9 lead. The action heated up in the second. Michelle Giaslerova tied the game up for the Bison with a 3-pointer early in the stanza. Bison sophomore Autumn Ogden gave NDSU the lead with a layup on the next possession. Chloe Lamb gave the Coyotes the lead back with a 3-pointer, but USD could not pull away. The gap sat between two and five points as the sides swapped baskets. The Bison regained the lead midway through the quarter as Rylee Nudell hit back-to-back 3-pointers. But Lamb answered with a trey of her own on the next Coyotes possession. That kicked off three minutes of scoreless action before USD hit a late layup and went into the break with a three-point cushion. NDSU got one last lead out of the break, with Marina Fernandez getting the lay in. But after that, it was all Coyotes. USD then had three straight threes to push the lead out to eight. A 10-0 run followed, and, despite an old-fashioned 3-point play from Nudell to end the quarter, the Coyotes had a 59-46 lead heading into the final 10 minutes. USD continued to pour it on in the fourth, shooting 57.7 in the second half from the field and 75 percent from behind the arc. The Bison could not respond and hit just eight shots from the field in the final 20 minutes. Nudell was the only Bison to reach double-digits in points on the evening with 18. She also led the team with six rebounds. The result kept South Dakota undefeated in Summit League play, one game ahead of SDSU. Meanwhile the Bison fall to 1-8 in the Summit, rooted to the bottom of the standings alongside Fort Wayne and a half game behind Omaha. NDSU close out the season with four of their last five games at home, starting Thursday against Oral Roberts.